Much has been written about planning high technology classrooms to promote the highest degree of learning. At the outset, we should underscore our belief that there is no one "correct" or even "best" design solution. Classroom design should result from a clear understanding of the range of teaching requirements that the spaces are intended to serve. 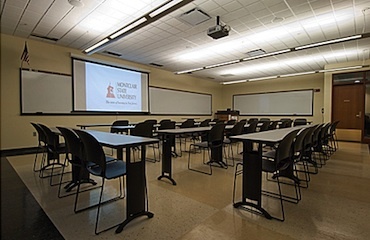 One way to broadly segment classroom types is to determine the degree to which the classroom will be used primarily for lecture-type presentations, the degree to which the furniture should be stationary, and whether the size of the student population will exceed 35 to 45 students. Spaces that meet these criteria are typically referred to as lecture halls and are characterized by having a central visual focal point, or front of the room. In contrast, more intimate rooms with movable furniture and intended for interactive discussions often have no "front." We will say more about designing these kinds of rooms in a future newsletter. In this article we will look at issues relating to rooms that have a formal front. Our goal will be to identify the elements at the front of the room that must be considered, understood, and prioritized, in order to create an effective teaching space. Writing surfaces are the most basic tools that teachers use. But more important than the choice between whiteboards and blackboards should be the issue of how much surface to provide and how to integrate it in the front wall. Most modern rooms have left and right boards. Writing surfaces that are higher than the teacher can reach serve no purpose. As a result, motorized or counter balanced raise/lower boards are often used. Depending on the ceiling height, board configurations with two or three writing surfaces are integrated on each side. Large screen video displays are commonly used in most classrooms. The most cost-effective solution (and the solution that provides the best quality) is to combine a ceiling-mounted raise/lower projection screen used with a ceiling mounted video projector. Keep in mind that projection screens must be sized so that the text is legible to those seated at the rear of the room, the angle of view is optimized for those seated at the extreme left and right of the screen, and the screen is mounted high enough so that all participants can see the bottom of an image. These criteria have significant impact on the geometry of the room, including the ceiling height. A standard 9' 6" ceiling is often not sufficient, depending on the depth of the proposed room. Studies and calculations can be done to estimate the viability of specific designs in advance of actually building them. A conflict arises because the projection screen almost always blocks a portion of the writing surface. At this point, some sort of compromise is needed. Placing the projection screen in the center of the writing surface may not be a good choice because it relegates and minimizes the remaining writing area to the extreme left and right of the viewing area. It's a good idea to consider locating the screen to the left or right side of the front of the room. In this way, projection and writing surfaces have equal priority and availability. 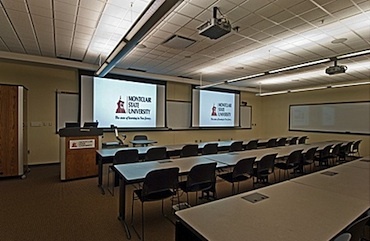 Two alternate classroom designs, both from Montclair State University. Another alternative is to provide two side by side screens, allowing an instructor to mix and match using all writing, all projection, or one of each kind of surface. Commonly, fixed and portable projectors are used to create dual projection. For those who are fans of interactive whiteboards, keep in mind that these surfaces are limited in size, and would likely not work well in larger lecture halls. Often, institutions choose to project on whiteboards or so-called projection-capable writing surfaces. In our experience, these solutions suffer from severe hot spots, dull images, or very limited viewing angles. However, since beauty is in the eye of the beholder, if testing results in acceptable images, it can be considered as well. We refer to an instructor's workstation as any place where an instructor periodically returns during classroom activities. Examples include a fixed lectern, a table with a raised podium extension, a simple table used by the instructor to store handouts, or a place to sit during class. Whatever the furniture may be, it should be located left or right of the front of the room, so as not to block viewing of writing or projection areas. Often the decision is made to locate the workstation opposite the entrance to the room. The instructor's workstation often has a built-in computer or the ability to accommodate a laptop. Appropriate power and LAN connectivity should be provided. Moreover, the workstation should be able to accommodate the instructor's notes and, if appropriate, an audiovisual control panel. Keep in mind that most or all of the AV equipment need not be located in the lectern and may be better placed in a small lockable built-in cabinet at the front or side of the room. Obviously, more flexibility in design can be achieved in a new construction project in contrast to a retrofit. The larger the capacity of the room, the more challenges there are in developing room geometries that optimize a space. Take the time to understand the tradeoffs involved in designing great larger classrooms by looking carefully at the front of the room.